Tim Howard is the current goalie for the U.S. Men’s National Soccer Team. He is also involved with Athletes in Action, a ministry arm of Campus Crusade for Christ. On June 7, 2014, in the build up to the 2014 FIFA World Cup, Howard received his 100th cap for the United States in a 2–1 defeat of Nigeria. On June 22, Howard was named man of the match for his display during the USA’s 2–2 draw with Portugal; his most notable save was a reaction stop to deny Éder. On July 1, Howard was again awarded man of the match, despite the U.S. losing 2–1 to Belgium. During the match, he broke the record for most saves in a World Cup match with 16. 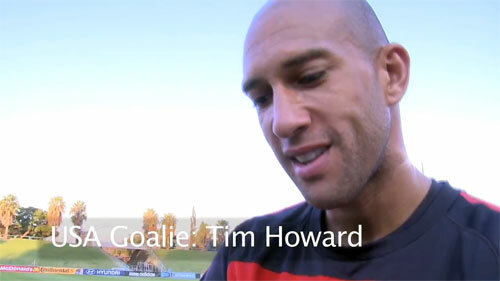 Photo shows USA goalie, Tim Howard, speaking about his Christian faith.